Successful contracts deliver the desired outcomes of both the buyers and seller through a form of commercial construct. This is the classic “win-win” outcome that we all strive for. balances the needs within a usable Commercial Construct. This is achieved by aligning the Seller’s Needs against delivery of the Buyer Needs as reflected in the Commercial Construct. The included diagram highlights the interaction between these three areas. Highly successful PBCs deliver this by balancing the requirements of each party with the consequences (rewards and remedies) that provides both positive (carrot) and negative (stick) incentives. The Buyer Needs represents the traditional specification of requirements. In sustaining ment of complex materiel we group these requirements into three broad areas of Asset Usage, Asset Optimisation and Asset Preservation underpinned by Safety Culture, Cost Conscious and Positive Behaviours. The Seller Needs represents both the financial and non-financial outcomes required by the seller. These outcomes range from contract price and profit margin to contract duration and recognition schemes. The Commercial Construct represents the agreement between the parties that fairly motivates and delivers both Buyer Needs and Seller Needs. The optimal Commercial Construct is a balance of conventional (written) contracting protections and a relational contracting approach. moving vertically (up / down) changes the outcome for both the buyer and seller; the top edge meets the Buyer Needs but may be seen by the seller as punitive and a “bad deal” whereas the bottom edge meets the Seller Needs but may be seen by the buyer as risk free providing no assurance of performance. 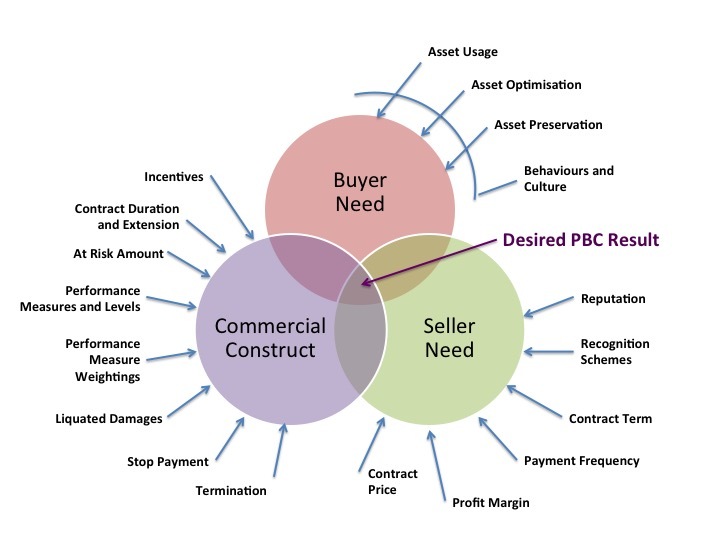 Acknowledging these extreme edges, the ideal PBC is one that balances each of these three areas represented by the overlapping region in the centre of the diagram where the Buyers Needs are delivered by linking these to the Sellers Needs through a fair Commercial Construct. So how do we achieve this balance? An alternate option is to design our Commercial Construct with a range of consequences that scale (escalate) based on significance of performance variation from our requirements, both in terms of duration and impact of the variation on the buyer. This approach can be seen in Table 1. Here commitments represents consequences that are either too good to refuse or too bad to accept. In these cases the consequences, either positive (carrot) or negative (stick), must be of such significance to disable future choice. On the other hand, incentives represent consequences that guide rather than disable choice. Here the significance of the consequence allows choice. One approach I have seen used with good results is to offer a default Commercial Construct to contract authors that includes a range of consequences that scale (escalate) based on significance of performance variation from our requirements. Our goal should be to ensure that we design and maintain PBCs that drives the right behaviour in the seller, provides adequate commercial protections for the buyer, and balances these needs within a usable Commercial Construct. PBCs that appropriately balance these areas will result in an effective, efficient and affordable solution. Please feel free to leave a comment on your thoughts on this framework. Complex materiel is defined as those assets that support military operations through flying (e.g. aircraft and helicopters), sailing (e.g. ships, boats and submarines), driving (e.g. wheeled and tracked vehicles) and transmitting (e.g. satellite ground stations). This entry was posted in Definition, the How and tagged Ian Ayres, PBC, PBL, Performance Based Contracting, Performance Management Framework. Bookmark the permalink.